In the first part of this series, we built a Docker swarm, consisting of just one node (our local machine). The nodes can act as swarm-managers and (or) swarm-workers. Now we want to create a swarm that spans more than one node (one machine). First, we set up a cluster, consisting of Virtual Machines. We have used Vagrant before to create Virtual Machines on our local machine. Here, we will use docker-machine to create virtual machines on VirtualBox (you should have VirtualBox installed on your computer). docker-machine is a tool to create Docker VMs, however, it should not be used in production, where more configuration of a virtual machine is needed. docker-machine uses a lightweight Linux distribution (boot2docker) including Docker, that will start within seconds (after the image was downloaded). As an alternative, you might use the alpine2docker Vagrant box. Swarm initialized: current node (9cnhj2swve2rynyh6fx7h72if) is now a manager. The main difference between a worker node and a manager node is that managers are workers that can control the swarm. The node I invoke swarm init, will become the swarm leader (and manager, by default). There can be several managers, but only one swarm leader. During initialisation, a root certificate for the swarm is created, a certificate is issued for this first node and the join tokens for new managers and workers are created. Most of the swarm data is stored in a so Raft-database (such as certificates, configurations etc.). This database is distributed over all manager nodes. 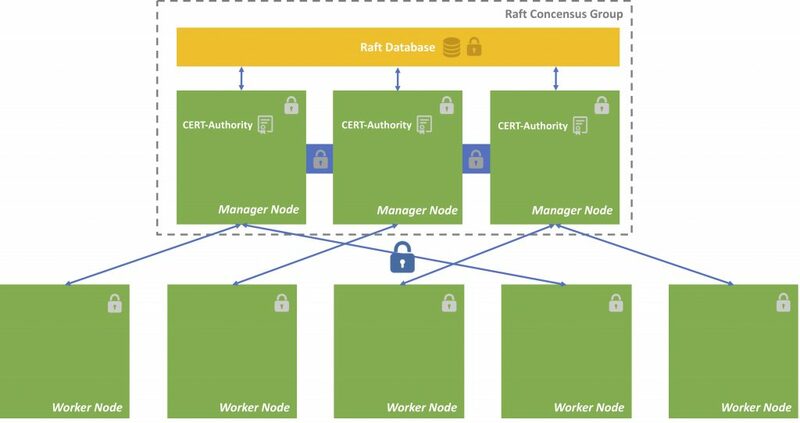 A Raft is a consensus algorithm that insists consistency over the manager nodes (Docker implementation of the Raft algorithm). thesecretliveofdata.com provides a brilliant tutorial about the raft algorithm. Most data is stored encrypted on the nodes. The communication inside of the swarm is encrypted. dictates docker, to run all commands against vm-manager, e.g. the above docker node ls, or docker image ls etc. will also run against the VM vm-manager. So now I can use docker node ls directly, to list the nodes in my swarm, as all docker commands now run against Docker on vm-manager (before I had to usedocker-machine ssh vm-manager docker node ls). To reverse this command use docker-machine env -u and subsequently eval $(docker-machine env -u). Now we can use the example from part I of the tutorial. Here is a copy of my docker-compose.yml, so you can follow this example (I increase the number of replicas from 3 to 5). 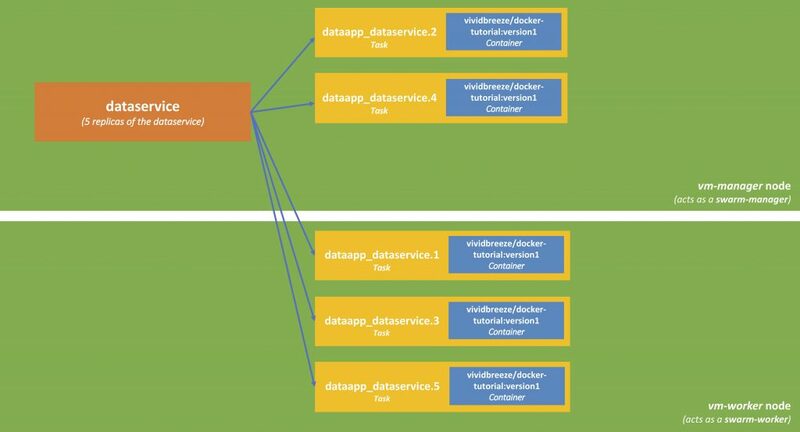 Docker created a new service, called dataapp_dataservice and a network called dataapp_default. The network is a private network for the services that belong to the swarm to communicate with each other. We will have a closer look at networking in the next tutorial. So far nothing new as it seems. As you can see, the load was distributed to both VMs, no matter which role they have (swarm manager or swarm worker). If everything is working, we should see five different kinds of responses (as five items were deployed in our swarm). The following picture describes shows how services are deployed. 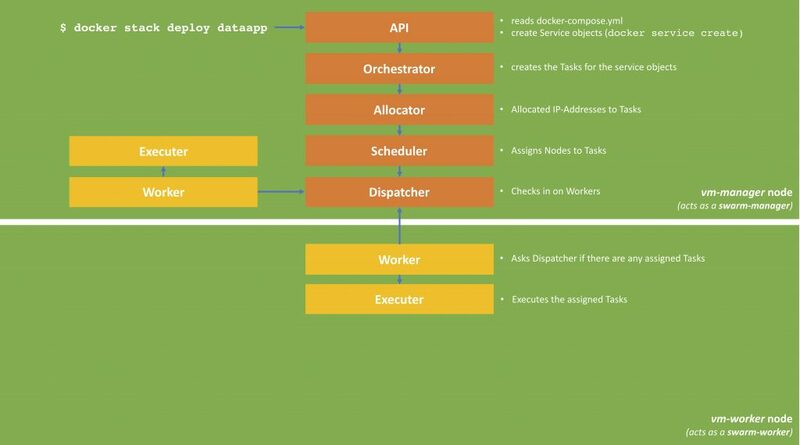 When we call docker stack deploy, the command transfers the docker-compose.yml to the swarm manager, the manager creates the services and deploys it to the swarm (as defined in the deploy-part of the docker-compose.yml). Each of the replicas (in our case 5) is called a task. Each task can be deployed on one or nodes (basically the container with the service-image is started on this node); this can be on a swarm-manager or swarm-worker. The result is depicted in the next picture. A moment later you will see all 5 tasks running up again. Let us now assume that the workload on our dataservice is growing rapidly. Firstly, we can distribute the load to more VMs. As you can see when using docker stack ps dataapp, the tasks were not automatically deployed to the new VMs. docker stack ps dataapp shows that 5 new tasks (and respectively containers) have been created. Now the swarm-manager has utilised the new VMs. Use docker-machine (as an alternative to vagrant or others) to create VMs running Docker. Use docker swarm to define a cluster that can run your application. The cluster can span physical machines and virtual machines (also in clouds). A machine can either be a manager or a worker. Use docker stack to deploy your application in the swarm. This again was a simple, pretty straightforward example. You can easily use docker-machine to create VMs in AWS E2 or Google Compute Engine and cloud services. Use this script to quickly install Docker on a VM. A quick note, please always be aware on which machine you are working. You can easily get the Docker CLI to run against a different machine with docker-machine env vm-manager. To reverse this command use docker-machine env -u.